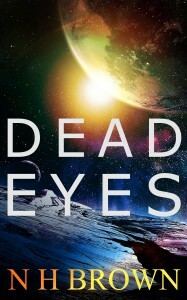 Nick has recently published ‘Dead Eyes’, a small ebook containing three futuristic short stories. You can read the start of the first story below. 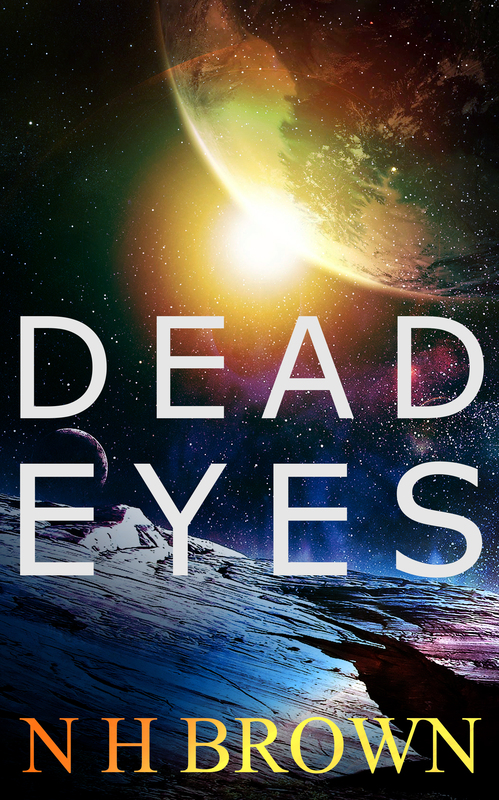 If you would like to buy it from the UK, it can be found here (99p) and from the US here (99c). Mackey lurched into the bay, head fogged by cheap brandy and red beer. Stopping to enjoy the refreshing rain, he gazed up at the dark bulk of the Great White and wondered if he’d ever get enough money for that new paint job. Not with harbour fees, fuel bills and bar tabs that had recently surpassed eighty thousand. ‘Ramp’s over here,’ said DeMarco through the speaker, her voice echoing around the cavernous space. ‘Ha ha.’ Mackey wiped rain off his recently shaved scalp, reorientated himself and stalked over to the ramp. The twin lines of blue lights greeted him like familiar friends as he ascended into the ship. ‘Need a hand there, skipper?’ Banks – the rookie – got up off the couch, smiling. He always seemed to be smiling. Banks’ face was a blur. A smiling blur. Mackey decided he might be better off sitting down. He slumped onto his chair and tried to look sober. It had just occurred to him that if the rookie thought his captain was a drunk he might jump ship. And if he did, Mackey wouldn’t get his training grant. Banks went back to studying his data-pad. ‘Just the twice actually.’ DeMarco came down the access ladder and dropped athletically into the lounge. ‘Any messages?’ asked Mackey, who never took his comcell with him if he was intending to have a good time. ‘Does that mean we’re leaving?’ asked Banks. ‘Really? Oh.’ Mackey never took his watch out with him either, but that was because he didn’t want to lose it. It had been a gift from his second wife, who he’d much preferred to the first and the third. ‘It’ll be more like cross eyes unless you get some sleep,’ offered DeMarco. Nine hours later, he returned to the lounge to find DeMarco, Banks and Chang on the couch. They had used the arm to position the big screen in front of them and the first claims were already up – chunky white text on blue. ‘Hey, skip,’ grunted Chang. Sentences of English from him seldom exceeded three words. He was still the biggest human Mackey had ever met; the main reason he had hired him. ‘Hey.’ After a shower, a few tablets and some food, Mackey was feeling a lot better. He glanced across at DeMarco, who had tied her long, red hair up and was staring intently at the screen. Banks was alternating his gaze between the feed and his data-pad. The next three claims were similarly useless. The drone sitting on the shelf opposite him remained obstinately inactive. ‘Went again yesterday, skip,’ said Banks. ‘Jesus.’ DeMarco reached over the back of the couch and took a jug out of the fridge. She also passed Mackey a clean glass. As he drank, the next claim popped up. Mackey would defer judgement until the location and the resource identifier came up. ‘So?’ asked DeMarco impatiently. She was an excellent pilot and navigator but seemed unable to retain any information about what planets were actually like. DeMarco sighed. Chang swore quietly in Chinese. Mackey hadn’t been able to pay them a bonus in months. ‘Any idea how many on the list?’ he asked. The Canadians had just established a huge manufacturing facility in the same system. Word had it they were expanding. They would need plastics. A lot of plastics. He thumped the table hard enough to spill water from his glass. DeMarco was already on the move. Chang knew nothing about the ship and never showed even the slightest inclination to learn. That didn’t bother Mackey; he paid him for one thing only, which he did exceptionally well. Half the screen switched to coms. The screen displayed his words and a flashing symbol to show the message had been sent. ‘Who?’ said Chang as he ran a hand across his spiky black hair. DeMarco was efficient but she couldn’t do everything and he wanted to be off Akaari Prime within the hour. Send money now! He was here two days ago. Mackey would have run into the cockpit except he now had a huge hand clamped around his arm. ‘Bonus?’ asked Chang. It hadn’t taken him long to learn that word.